The XDF is the deepest image of the sky taken with Hubble for searching for the earliest galaxies. It includes ALL images taken by Hubble on the small patch of sky first imaged as the Hubble Ultra-Deep Field (HUDF) and subsequently as the HUDF09 and HUDF12. The XDF also adds images that overlapped the HUDF from many other programs including CANDELS, supernova searches and many others (19 in total). These images were taken over a decade from mid-2002 through to early 2013. The XDF is an exposure of 2 million seconds total from Hubble's two premier cameras, the Advanced Camera (ACS) and the Wide Field Camera 3 (WFC3). It consists of 2963 separate images from the ACS and WFC3/IR. ACS flew on the Shuttle to Hubble in 2002 on servicing mission SM3B, while the Wide Field Camera 3 (WFC3) flew to Hubble in 2009 on the final Hubble Shuttle mission (SM4). The XDF includes ALL data taken by Hubble on the small patch of sky first imaged as the Hubble Ultra-Deep Field (HUDF). These images were taken over a decade from mid-2002 through to early 2013. The XDF is an exposure of 2 million seconds total from Hubble's two premier cameras, the Advanced Camera (ACS) and the Wide Field Camera 3 (WFC3). It consists of 2963 separate exposures from the ACS and WFC3/IR. ACS flew on the Shuttle to Hubble in 2002 on servicing mission SM3B, while the Wide Field Camera 3 (WFC3) flew to Hubble in 2009 on the final Hubble Shuttle mission (SM4). 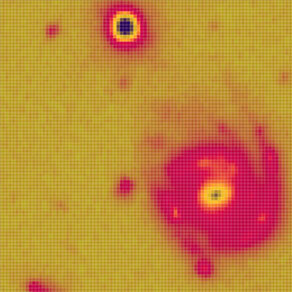 The original HUDF data demonstrated the power of Hubble’s new ACS camera in 2004. 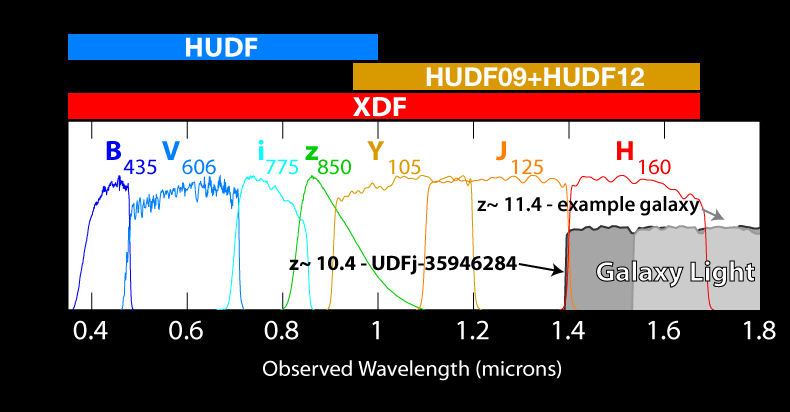 The original HUDF contributes, by time, a little more that half to the XDF, but only contains data in the optical ("visible") region of the spectrum. In 2009 and 2010, the HUDF09 project took images towards the red end of the spectrum in the near-infrared with the new WFC3/ IR camera. These new data doubled the waveband coverage and enabled exploration of a new realm of the most distant galaxies for the first time. The HUDF09 field with WFC3/IR and ACS contributed around 20% of the data by time to XDF. 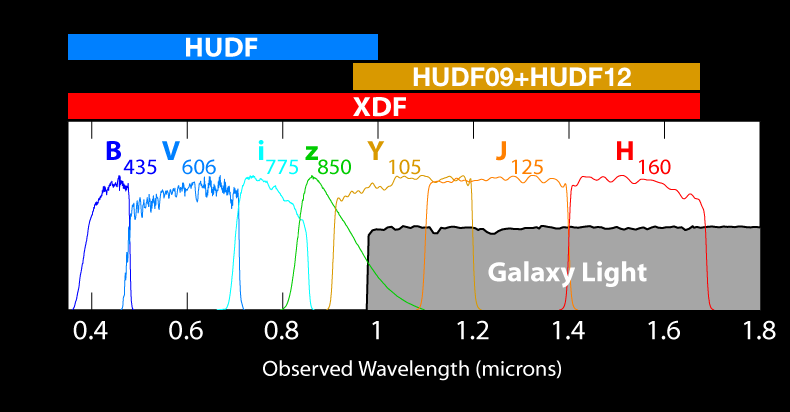 A subsequent study HUDF12 added more WFC3/IR data that enhanced the overall dataset by about another 10% by time, though both the HUDF09 and HUDF12 images contributed unique IR data that is essential for finding the earliest galaxies. 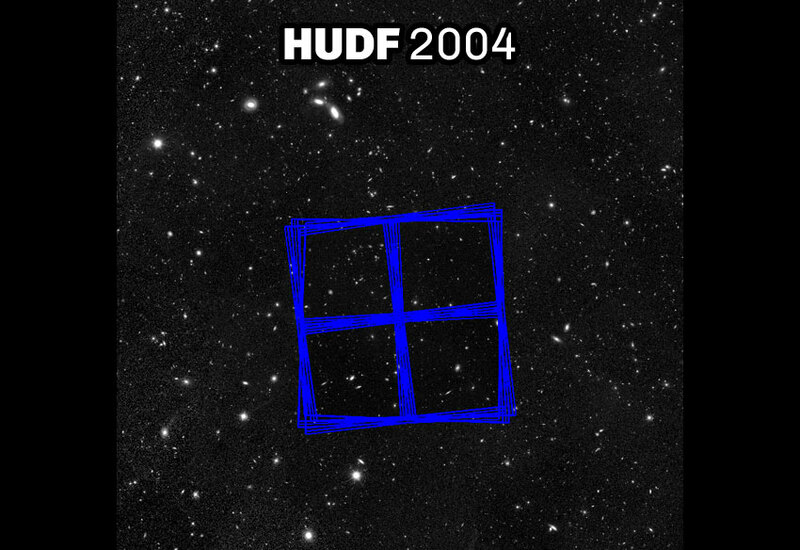 The HUDF and HUDF09/12 fields are shown in the first and second panels of the “Hubble Dataset Used to Build Up the XDF” slide shown below. The XDF/HUDF09 team then took ALL the other data on this region taken by numerous programs (see "Programs Used to Make the XDF" below) and combined it through a very laborious and careful series of steps into one incredibly deep image, the eXtreme Deep Field (XDF). These data fall at many locations and orientations and much careful checking was needed to make sure all the Hubble ACS and WFC3 images could be properly aligned and added together. The contributions from these other programs comprised nearly a quarter of the time, of which the largest was the CANDELS images from ACS and WFC3. The numerous images are shown in third panel of the “Hubble Dataset Used to Build Up the XDF” slide shown below. 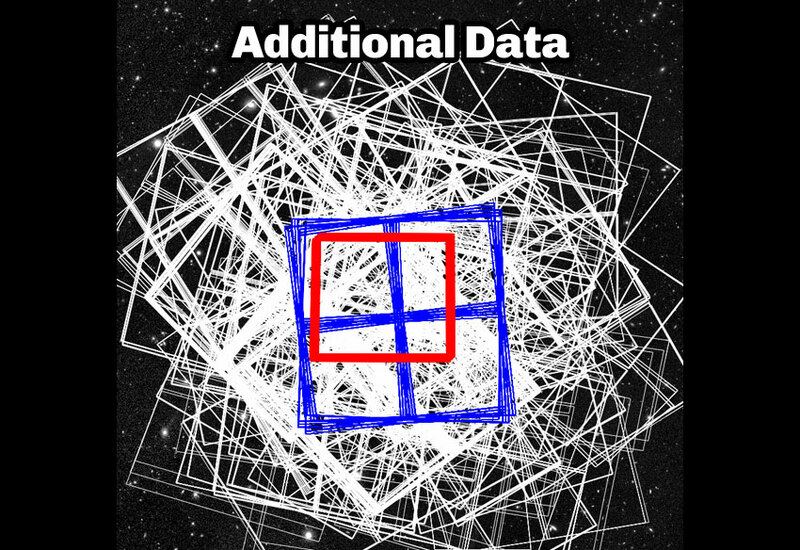 The XDF was then assembled using data from every image over the last decade from ACS and the WFC3 (the orange region in the fourth panel of the “Hubble Dataset Used to Build Up the XDF” slide shown below). XDF reaches back around 13.2 billion years, to just 450 million years after the Big Bang. The history of galaxies — from soon after the first galaxies were born to the appearance of the great galaxies of today, like our Milky Way — is laid out in this one remarkable image. The XDF combined image goes incredibly faint. The combined image XDF reaches to approximately one ten-billionth of what the eye can see. In astronomer-speak, XDF reaches to a 5 sigma limit is 31.2 AB mag (the limit for a 5 sigma detection of a point source, like a star, corrected to total magnitude, is ∼30.7 AB magnitude). This is equivalent to a 1 sigma noise fluctuation of 32.9 AB mag, as measured directly in a 0.33" aperture. The XDF is such an important field that it will be imaged in the future and more data will be added, but future gains will be slow until JWST is launched.. 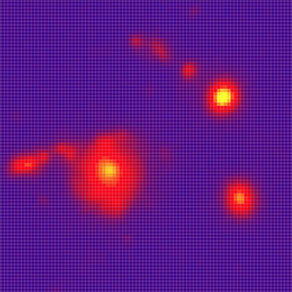 The first deep data in the ultra-violet from WFC3/UVIS has already been obtained. The ultra-violet imaging complements the redder optical/IR XDF and is being used by astronomers to study galaxies at later times when they are in transition to galaxies like today’s galaxies (including our Milky Way and Andromeda). The ultraviolet data has not been included since the UV data is relatively noisy and also cannot reveal galaxies in the first 2 billion years due to the absorbing effects of hydrogen in the universe. The details of how the XDF was generated from the decade-long source data from the HUDF region can be found in the paper that was written about the XDF ("The HST eXtreme Deep Field (XDF): Combining All ACS and WFC3/IR Data on the HUDF Region into the Deepest Field Ever", Illingworth, G. D.; Magee, D.; Oesch, P. A.; Bouwens, R. J.; Labbé, I.; Stiavelli, M.; van Dokkum, P. G.; Franx, M.; Trenti, M.; Carollo, C. M.; Gonzalez, V., 2013, ApJS, 209, 6). The paper was published in ApJS in 2013 and can be found at: http://adsabs.harvard.edu/abs/2013ApJS..209....6I. Position (J2000) R.A. 3h 32m 38s.5, Dec. -27° 47' 00"
This sequence shows how the XDF was built up from the numerous exposures that have been made over the HUDF field. The first image of the sequence shows the original HUDF data from the ACS. By fraction of the total time the original HUDF contributes over 50% to the XDF, but only contains data in the optical ("visible") region of the spectrum. In 2009, the HUDF09 project took images towards the red end of the spectrum in the near-infrared with the new WFC3/IR camera. These new data doubled the waveband coverage and enabled exploration of a new realm of the most distant galaxies for the first time. The second image of the sequence shows the HUDF09/HUDF12 field with WFC3/IR and ACS that contributed around a quarter of the data by time to XDF. 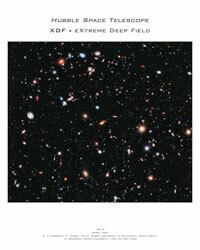 Finally, the XDF team took ALL the other data on this region taken by numerous programs and combined it through a very laborious and careful series of steps into one incredibly deep image, the eXtreme Deep Field (XDF). As the third image shows the data falls at many locations and orientations and much careful checking was needed to make sure all the Hubble ACS and WFC3 images could be properly aligned and added together. The contributions came from ten other programs that comprised about 20% of the time, of which the largest was the CANDELS images from ACS and WFC3. Finally, in the fourth image of the sequence the XDF is shown as the orange region where the contribution of every image over the last decade from ACS and WFC3 has been included. The XDF combined image goes incredibly faint. It reaches to approximately one ten-billionth of what the eye can see (in astronomer-speak it reaches to ~30.7 AB magnitude for a 5 sigma detection total magnitude). This video then depicts a flight through the galaxies in the XDF. Using measured and estimated redshifts for approximately three thousand galaxies, astronomers and visualizers constructed a three-dimensional model of the XDF galaxy distribution. The camera starts from Hubble's viewpoint, traverses more than thirteen billion light-years of space, and exits the data set past a "red dot" galaxy (or proto-galaxy) with a redshift of 7.82. For cinematic reasons, the exceedingly vast distances in the 3D model have been greatly compressed. XDF resulted from the realization in late 2011 that all the data taken over the last ten years with the Advanced Camera and the Wide Field Camera 3 on the Hubble UltraDeep Field had not been combined into a single extremely deep image. In discussions in late 2011 with an influential congressman, while doing the JWST Congressional hearing, Garth Illingworth realized that the HUDF images and posters found in many congressional offices, and used as educational materials across the country, were those from 2004. Our HUDF "deepest image" was out of date, even though it still looked good. A large number of new images had been taken since 2004. Hubble (and JWST) really needed a new "deepest" image for digital displays and a new poster to adorn walls all around the country. The Hubble UltraDeep Field (HUDF) was observed in 2003 with the then-new Hubble Advanced Camera (ACS) that had been placed into Hubble in 2002 by the Shuttle astronauts during the servicing mission SM3B. The ACS HUDF was released as a public image in 2004. The new infrared Wide Field Camera 3 (WFC3) was added to Hubble in 2009 by the Shuttle astronauts in the final Hubble servicing mission (SM4). 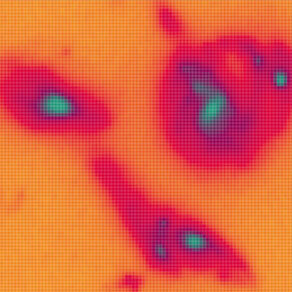 The HUDF was observed as part of the HUDF09 program in 2009 as one of the first set of images taken by the new infrared camera of WFC3 (WFC3/IR). These first observations were released as the HUDF09 image in early 2010. 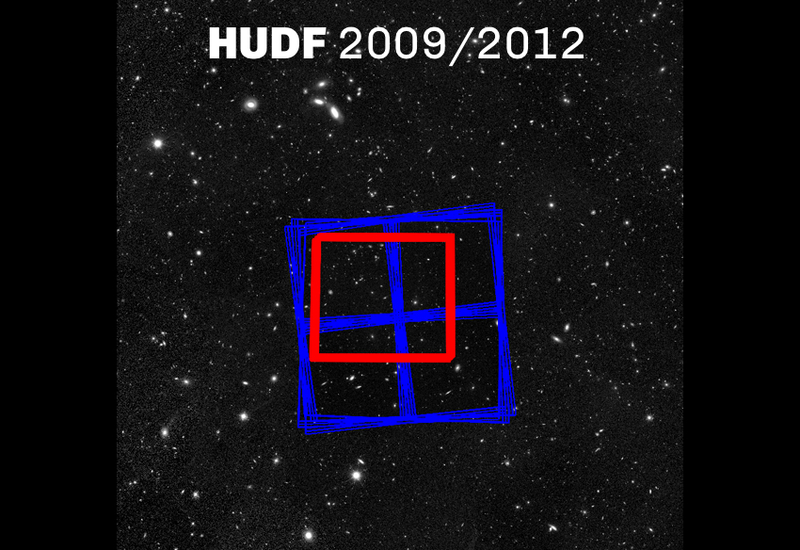 The HUDF09 observations were finally finished in winter 2011. The HUDF and HUDF09 have been released individually, but a combined image of ALL the images ever taken on the ultradeep field had not been done. Over the last decade fifteen different programs had taken data in this region, dominated by the original HUDF, the HUDF09, the CANDELS, supernova search programs, and a variety of others (with the the HUDF12 program expected in fall 2012). After discussions with members of the HUDF09 team we decided to collect and process all the data for an "everything on the HUDF" image. An initial discussion with Space Telescope Science Institute (STScI) confirmed for us that this was an idea worth pursuing. We started the assembly of all the images in early winter 2012. The images came from different cameras with different orientations and different amounts of overlap. Since very large numbers of individual images were involved, the processing and cross-checking involved a lot of effort and time. Refining the software and testing procedures, and assembling, checking and testing the co-added images, was a lengthy and time consuming task involving the XDF core team (Dan Magee, Pascal Oesch, Rychard Bouwens and Garth Illingworth) that continued through the spring of 2012. The image was finally ready in its first version by early summer 2012. Detailed communications with STScI regarding an image release ensued. Plans were developed for a number of products, in addition to the color image of the XDF. The products included a fly-through of the galaxies, explanatory images and text, and educational posters. 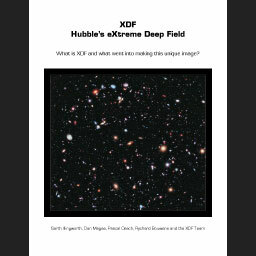 The image was named the eXtreme Deep Field (XDF) from a name developed and used earlier by the HUDF09 team in a proposal. Given that the combined image involved 10 years of data from numerous programs, and that it represented a stunning achievement of Hubble -- the "deepest image of the sky ever taken" -- the updated name seemed most appropriate. Given the length of time needed to develop all the release products, the schedule of summer vacations by key people and the focused media attention on the Mars Curiosity Rover landing in August 2012, the release was tentatively scheduled for September 2012. The final date chosen to fit with development of the data products and other NASA press releases was September 25, 2012. Following the media briefing the XDF team continued to work on incorporating the latest datasets as well (the HUDF12) and eventually completed the processing of 2963 exposures totaling about 2 million secs of data. The final images were extensively tested and checked as discussed in the XDF paper. Following testing the XDF images were released to MAST in early 2013 at: http://archive.stsci.edu/prepds/xdf/ A paper was also prepared and submitted to ApJ. This paper was eventually published in ApJS late in 2013 and can be found at: http://adsabs.harvard.edu/abs/2013ApJS..209....6I. What XDF is Compared to HUDF and HUDF09+HUDF12? XDF takes ALL the data that has been taken on the HUDF field between 2002 and 2012 - this means HUDF, HUDF09, CANDELS, HUDF12 and many other programs. No other release has done this. This makes the deepest image from Hubble ever, with the widest spectral coverage image from Hubble on the HUDF. In total, 2963 exposures totaling 2 million secs make up the XDF. XDF contains over 7000 galaxies. An example galaxy spectrum is shown. This example is a galaxy that is essentially invisible to the Advanced Camera for Surveys. It is so distant that its light has been shifted to the red so far by the expansion of the universe that it is only seen in the infrared with the Wide Field Camera 3 (in HUDF09 and HUDF12). This example galaxy is seen about 12.8 billion years ago, just 800 million years after the Big Bang. What is Hubble's Distance Limit? As galaxies get more distant their light is "redshifted" by the expansion of the universe. Ultimately the galaxy light moves so far to the red that it becomes invisible to Hubble's cameras. This effect is shown here. The most distant galaxy found in the HUDF09 image, UDFj-39546284, was thought to be at "redshift" 10.4 (represented by "z" as in z∼10.4), about 500 million years after the Big Bang. The light from UDFj-39546284 appears just in the reddest filter H160 of the WFC3/IR camera on Hubble, as shown in the figure below. The later data from the HUDF12 images showed that UDFj-39546284 was an enigmatic object and even more interesting than first thought. UDFj-39546284 was not at z~10.4, but could only be at z~12 or at z~2. This still remains unresolved. The ability of Hubble to see even more distant galaxies gets quickly worse. By "redshift" 11.4, just 400 million years after the Big Bang, or about 13.3 billion years ago, the light from a galaxy is only partially visible to Hubble in the reddest filter (a hypothetical example galaxy at 11.4 is shown in the figure). Even though a z∼11.4 galaxy is just 80 million years closer to the Big Bang than one at z~10, it is a great deal fainter and a lot harder for Hubble to see. Since galaxies are getting rapidly fainter at earlier times, "redshift" z∼11 or so is around the practical limit for Hubble. This becomes JWST territory. Galaxies closer to the Big Bang than about redshift 11.5-12, or about 370-400 million years from the Big Bang, cannot be seen by Hubble. James Webb Space Telescope is required to see the "first galaxies”. And only the very brightest galaxies around 400-500 Myr after the Big Bang can be seen with Hubble. To see how galaxies of all sizes grow in the first 500 Myr of the Universe falls into the realm of JWST — our future “first galaxies” telescope. The infrared images from the HUDF09 and HUDF12 programs are essential for searching for galaxies at these early times. A video of the "Meet the Hubble eXtreme Deep Field Observing Team" webinar, in which Illingworth and two other astronomers from the XDF observing team described how they assembled the landmark image and explain what it tells us about the evolving universe. Participants send in questions for the panel of experts to discuss. The webinar was broadcast at 10 a.m. Pacific Time on Thursday, September 27.